Unless you live under a rock and somehow completely ignore social media, you will have seen the RED STARBUCKS CUP controversy. Apparently a group of people are upset about the Starbucks red cup that lacks any other festive markings. WAR ON CHRISTMAS etc etc etc … nonsense. Controversy is coming to town. Starbucks’ festive red cups, which mark the upcoming holiday season annually, are being tainted this year by scandal. The tipping point of the scandal began after an American evangelist, Joshua Feuerstein, aired his grievances about the cup in a now-viral Facebook post. Red cups are now an issue? After years celebrating red solo cups? Is this actually part of our national discourse? When there are major problems that are actually plaguing our world? Like… for instance… unprecedented climate change!?!? As you can tell, I’m an embarrassed American. 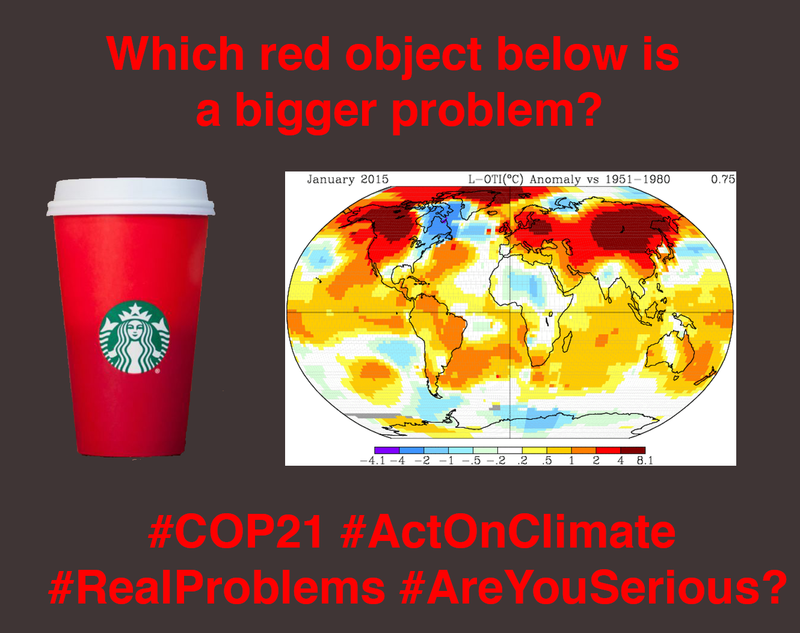 So I made the image above to draw attention to an actual problem and the upcoming UN climate summit in Paris. Obviously the red cup is the current seasonal Starbucks to-go cup. The earth graphic shows average global temperatures (from NOAA and NASA), with red being warmer than average – previous posts here and here. In fact, climate change is often depicted in RED!! UPDATE: I edited the image (new above, old below) after a wise friend pointed out that the original implied that there was a problem with the red cup, which is obviously laughable. Indeed, only one of the red objects is a problem for people living in reality.